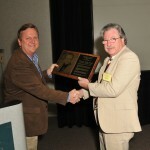 January 25, 2011 – The California Citrus Quality Council is pleased to announce that Charles (Chuck) Orman was honored at CCQC’s annual meeting as this year’s recipient of the prestigious Albert G. Salter Memorial Award. Orman served for 29 years on CCQC’s Board of Directors, 19 years as vice chairman, and filled in as acting president position twice. During his 30-year career at Sunkist, he worked diligently to improve fruit quality while working with “sound science” to break down trade barriers. He played a vital role for CCQC in the international arena where he represented the California citrus industry often at international Codex meetings where international pesticide residue standards were being set. He was a member of the Codex Alimentarius Committee on Pesticide Residues (CCPR), the Codex Committee on Food Additives and Contaminants (CCFAC) and often sat in the seat of the International Society of Citrus (ISC) as the citrus industry representative. He also served on various committees for the citrus industry for the North American Plant Protection Organization (NAPPO). Orman was instrumental in developing fumigation procedures for citrus fruit which led to changes in fumigation practices in Japan and Australia that significantly improved the quality of California citrus in those markets. He worked with CCQC and the US EPA to preserve the citrus industry’s use of various crop protection chemicals including pre- and post-harvest chemicals such as SOPP and 2,4-D. During his career he led efforts in pest prevention for medfly, fuller rose beetle, and more recently the Asian citrus psyllid and HLB. This award is in recognition of his leadership, and his commitment and dedication to the California citrus industry and to CCQC.